Throwing the latest viewership numbers in its face, Arnab Goswami, editor of Times Now proclaimed that his channel had returned to No. 1 and urged his rival (read India Today) not to waste its money on futile marketing campaigns. “Each time someone mocks or apes us, our viewership grows. There is a big lesson in this fact… I think it is time for the smaller channels to realise that aping the leader, or spending a lot of money mocking the leader is futile,” he said. India Today, formerly Headlines Today, is India’s No. 2 English news channel, and part of the India Today group. After the recent rebranding and renaming of the channel, it has been running advertisements targeted clearly at Arnab Goswami’s channel. It was emboldened after it toppled the long-time No. 1 India today as per data for week 22, which were announced a week ago. 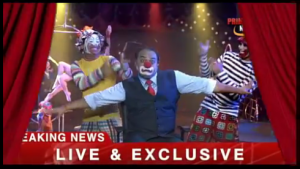 India Today’s ads largely revolve around the theme of Times Now having become a circus under the editorial style of Goswami. There is an ad in which an anchor, (possibly referring to Goswami himself) starts off the talk show with knives in his hands and proceeds to throw them at each of his panelists, nailing them on the spot. There is also one in which a reporter is seen dancing with the hoola hoop after inviting readers to catch up on the latest news. The ads are by far the most aggressive campaign by a media outlet against another. Though The Hindu has also attacked The Times of India through TV ads, the campaign was subtler. Before the advent of social media, Indian media observed a sort of ‘ceasefire’ and rarely attacked each other, at times even going to the extent of not even reporting factual news about their peers. Times Now has been number 1 for years, thriving under the leadership of Goswami who has a characteristically aggressive and ‘nationalistic’ approach to news. Though some have compared Times Now to Fox News in the US, Times Now has been careful not to betray any political leanings, and has carried stories criticizing leaders from across the political spectrum. Key to Times Now’s success has been Arnab’s location in Mumbai. Unlike other prime-time anchors and high-profile editors, Goswami has a reputation for not socializing with politicians and businessmen — a fact that he repeatedly highlights since the India Today campaign began. While other editors are seen as close to one party or the other, Goswami has maintained a reputation for being neutral, helping his channel retain credibility in the eyes of the public. This, according to most industry experts, is the biggest reason for Times Now’s popularity. In a statement, however, Goswami chose to attribute Times Now’s popularity to news breaks. “My experience has been that leadership is built by doing the news, not by negative marketing campaigns,” he said. He called the other four English news channels “smaller channels”. “Besides, the massive public response to our Lalitgate expose matches the growing number of our viewers.. Four smaller channels don’t match up to TIMES NOW,” he said, referring to his channel’s coverage of the Lalit Modi episode. He said that according to the data for the latest week (week 23), Times Now had gross television viewership (in thousands) points of 345 compared to only 129 for India Today and 75 for NDTV. CNN-IBN, which was recently acquired by the Mukesh Ambani group, had viewership points of 50, while News X had 32. The data is valid for towns with 1 mln and above population and only for males aged 22 and above. For Week 23, Times Now had a ‘time spent per viewer’ (TSV) of 5 minutes/day, while NDTV had 4 and India Today 3..
Goswami, who has been criticized for his ‘nationalistic’ approach to issues like diplomacy, defense and international relations, was recently given additional charge of ‘ET Now’, the business news channel from the Times of India group.